Needing a new roof shouldn't cause so much stress! From dealing with your insurance company to finding the right type of roof and quality of product is overwhelming. We’re here to guide you through the process of roof replacement and vow to walk you through it from filing your claim to your finished roof. We have the integrity and experience in the field so all you must do is set back and enjoy that new roof knowing it is handled right every time with GAL-TECH ROOFING. We offer a 10% Discount for first responders, teachers and military members! Call Today for a Free Roof Replacement Estimate! With our years of experience, We understand the claims process and we work with all insurance companies to get the money you deserve on your claim. We walk you through the process and make it easy and painless so you don’t have to worry about a thing. We pride ourselves in our expertise in the field, so you can rest assured you are getting not just quality workmanship but also the highest quality product as well for your roofing needs. We will help guide you through the buying process to make sure we match you to the best possible solution for your unique needs. Your new roof will typically have a five-year workmanship warranty and a twenty to forty-year manufacturer warranty, so you will be covered and will not have to worry about your roof leaking again. Call us today so we can assess your needs and provide you with a FREE estimate! "Gal-Tech Roofing was very professional. Answered all our questions upfront and were honest. The day of the job they arrived on time and finished the same day. I highly recommend using them for your roof." Composite roofing gives you a variety of color options and sizes depending on product and is the most common type of roofing on residential homes. Torch down is used for roofing a flat roof. It requires an additive to stabilize its ability to expand or contract during changes in weather patterns. Stone Coated Steel roofing is extremely durable and made from metal with stone chips. This roof retains the look of a more traditional roof. Standing seam metal offers better cooling than shingled roofs. The long panels run from the top of the roof to the eaves and the seams are raised to protect from leaks. EPDM is an extremely durable synthetic rubber roofing. It is widely used in low-sloped buildings to prevent water from pooling and causing damage. The SPF roof system is composed of two liquid chemical compounds called isocyanate and polyol that form the base of an adhered roof system. A protective surface is then applied to the foam to provide an added barrier against the elements. 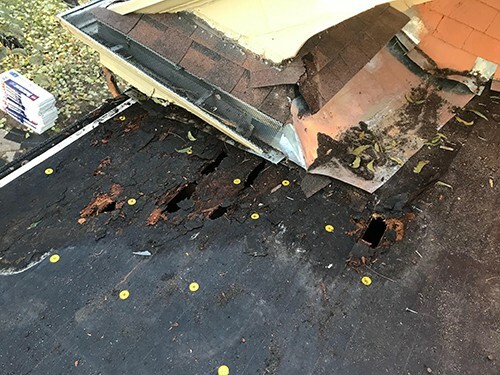 The answer depends on whether the roofing shingles are past their prime or the original roofing contractor installed part of or the whole roof system improperly. Perfectly good roofing shingles can be repaired if the damage hasn’t affected their integrity. If your roof shingles are old and decaying, it’s economically smarter to replace the entire roof. How do I know for sure I need a new roof? Older roofing shingles and wood shakes typically have a 15- to 30-year lifespan depending on the shingles’ quality, the location and tree cover of your home, and how well the roof was installed originally. Direct sunlight, weather/wind, and poor roof deck ventilation are rough on roofs. If a residential roof is over 15 years old, we recommend you call us out for a look. Sometimes damage isn’t visible to the untrained eye on the ground, and catching it early can avoid expensive interior repairs in the future. This depends on whether the roofing shingles are past their prime or the original roofing contractor installed part of or the whole roof system improperly. Perfectly good roofing shingles can be repaired if the damage hasn’t affected their integrity. If your roof shingles are old and decaying, it’s economically smarter to replace the entire roof. Several factors go into determining the cost of your new roof. They include the quality and professionalism of your roofing contractor; the brand, type and grade of roofing shingle you select; the size of your roof and the shape and slope of your roofline. Don’t choose a roofing contractor on cost alone. Price is a factor, but not the only factor you should consider. Quality roofing material and contractor workmanship have value. Hiring the cheapest roofing contractor could cost more in the long run when you consider the cost to repair sub-par roofing and the damage it causes. Get a roofing estimate for an accurate idea. GAL-TECH ROOFING estimates are convenient, fair, no obligation and you don’t have to be home. How do I choose the right shingles? This is a roofing question where aesthetics and finances come into play. Not one roofing shingle manufacturer compensates GAL-TECH ROOFING to promote their products. Having been a roofing contractor for many years, we can recommend without hesitation CertainTeed and GAF asphalt shingles. For the vast majority of homes In Granbury, Hood County and the DFW area, these roofing shingles deliver the best value for the money and look for curb appeal. Will I have to replace gutters and downspouts too? If your gutters and downspouts are in good shape, our roofing contractors will work around them. To avoid damaging them, we don’t remove and reinstall them once your roof is complete. If your gutters are in relatively good shape, but need minor repair, we can provide this service too. GAL- TECH ROOFING is a full-service roofing contractor. How long will it take to install my new roof? Of course there are variables that affect all roofing projects, like weather, whether or not there is a second layer to remove, and more. But typically, GAL-TECH ROOFING contractors are completely finished with your new roof—from removing the old roof to clean up—in 1-3 days.